Superfoods are mostly plant-based foods but can include dairy and protein, which are thought of as nutritionally dense and therefore beneficial to your health. Because superfoods don’t actually have their own official food group, the term seems more for marketing appeal. Although there are no official criteria, superfoods can be classified due to nutrients. Any food with an extremely dense amount of essential nutrients, vitamins, minerals, good fats, antioxidants, and healthy enzymes can make the list. Superfoods should also be known for lowering the risk of certain diseases associated with the body. You don’t have to travel to a health food store for superfoods. In fact, many of the superfoods can be found at your local supermarket. 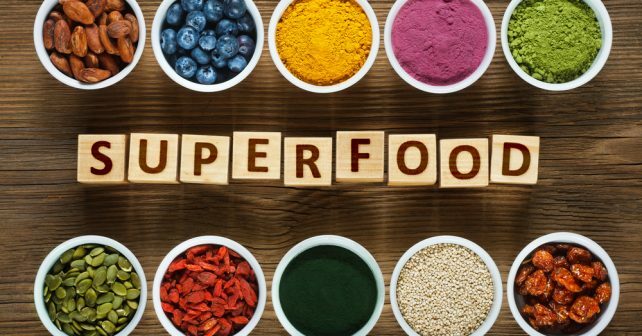 You may have already been eating some superfoods and don’t know about the benefits. All nuts are high in protein and healthy fat, which can promote satiation. However, the best nut of choice is the almond. A study found eating almonds could increase your calorie burn for up to three and a half hours. 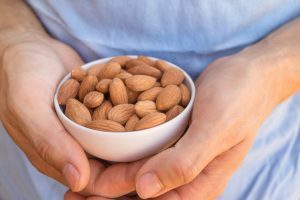 Almonds can help burn belly fat, according to a study published in the Journal of the American Heart Association in 2015. Almonds contain vitamin E, which helps defend against sun damage that could lead to skin cancer. In addition to protecting your skin, almonds can improve cognitive and memory functions. Other benefits are a better sexual function, a decrease of bad cholesterol, and reduction of blood pressure, just to name a few. Be sure to practice portion control because almonds are caloric. A serving is around 28 nuts. If you don’t have a measuring cup, a handful of nuts is a good size to limit yourself to. Sprinkle a few on a salad or on top of your morning oatmeal. Avocado toast is trendy for a reason. The avocado is a nutritional powerhouse due to their heart-healthy monounsaturated fat or oleic acid, an ideal fuel source for the body. Along with a slew of vitamins and nutrients, avocados have a third of the recommended daily fiber intake. Do you think bananas are the best source of potassium? That’s where you’re wrong, for an avocado has more potassium than a banana. By canceling out salt’s negative effects, potassium helps lower blood pressure. If you’re at risk for hypertension, avocados are a great choice. Fresh guacamole is both delicious and a prime way to reap the benefits of avocado. You could also add a slice or two to a salad or on a sandwich. Some people scoop out and eat the inside of an avocado just how it is. Ensure an avocado is ripe by giving it a gentle squeeze — if it yields to the pressure, then it’s ready to eat. Any kind of berry contains the flavonoid anthocyanin, which might promote more efficient functions in the brain, especially when you get older. The blueberry, in particular, is loaded with antioxidants that can prevent harmful free radicals in the body. Out of all the berries, blueberries are the highest in antioxidants. Blueberries are not only a superfood for their nutrients, but also for their versatility. Add blueberries to pancake or muffin mix for scrumptious blueberry muffins. Puree blueberries into a sauce to drizzle on top of meats. Have a bowl of fresh blueberries on their own for a refreshing summer snack. Mom was right about eating your greens. Dark green vegetables contain vitamin A, C, and K, and minerals such as calcium. Their fiber also helps control your appetite. Broccoli contains a chemical called sulforaphane that helps fight off cancer and offsets the development of prostate and bladder cancer. Kale contains anti-inflammatory properties that are good for detoxing and heart support. Spinach can actually serve as a good source of protein and BCAAs. You don’t have to succumb to a salad to get a serving. Bake kale in the oven to make your own kale chips. Add broccoli to a chicken stir-fry. Don’t fear the green smoothies either. By putting a banana or half a cup of mango into the blender, and perhaps a touch of orange juice, you won’t even taste the vegetables. Fish itself is the best source of protein, particularly for weight loss. Most notably, salmon contains healthy omega-3s. A new discovery of salmon surrounds the health benefits of its protein and amino acid content. This fish, in particular, contains bioactive peptides that support joint cartilage, insulin effectiveness, and control of inflammation in the digestive tract. 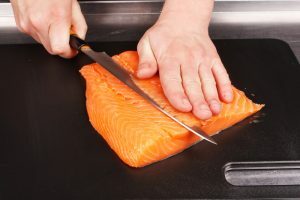 The best ways to prepare salmon are broiling, grilling, poaching, and baking. Avoid eating battered and fried salmon, due to the added fat content. Cherish salmon for its natural, healthy fats. These orange gems are high in vitamin B6, and vitamin C. Vitamin B6 can lower homocysteine levels which have been linked with degenerative diseases such as heart attacks. Contrastingly, vitamin C helps produce collagen which can retain your skin’s youthful elasticity. Sweet potatoes come with an array of nutrients such as potassium, iron, and magnesium. Their high amount of carotenoids, specifically beta-carotene, helps to ward off cancer as well as the effects of aging. Contrary to popular belief, they do not spike your blood sugar. You can replace regular mashed potatoes with mashed sweet potatoes for Thanksgiving. Put a healthy spin on fries by cutting up a sweet potato length-wise and baking it in the oven. Season with sea salt, cayenne pepper, or cinnamon, depending on your preference. Superfoods are a nutritious and delicious addition to any meal. Their properties have cosmetic effects such as anti-aging and weight loss and can boost the immune system and prevent cancer. Plus all of them can be prepared in multiple yummy ways. Don’t hesitate to buy some of the items on this list and obtain the benefits of these superfoods!